So, exactly how reliable is travel insurance? I'd say very. Well, most times it is. What is certain is that travel insurance has become imperative these days in view of the multitude of very real risks associated with modern-day travel - from flight disruptions due to poor weather to contracting a flu strain while abroad to having some crazed fanatic hijack the plane you're on. And so it was that one such misfortune should befall my wife and I in the spring of 2010. We'd just arrived in London from the Cotswolds when we learnt of the Eyjafjallajokull volcanic eruption in Iceland the previous day and the resultant airspace closure over parts of Europe. At the time, we didn't for a moment think that our travel plans would in any way be affected. I mean, such things only happen to other people, right? WRONG. Three days later, we were unceremoniously informed by Singapore Airlines by text message that our flight home's been cancelled indefinitely (yes, Oi Len and I were among the millions caught out in Europe "the day the skies stood still"). Concerned but unafraid, we took comfort in the knowledge that our predicament was adequately covered by the travel insurance we'd taken from Allianz for this trip. This was, after all, nothing more than a routine case of flight cancellation due to hazardous weather conditions. Or so we thought. On returning home after being stranded in London for 4 days, we immediately lodged our insurance claim, declaring in good faith that our original flight back had been cancelled - never for a moment expecting the word to eventually become a point of contention. Within a mere day and a half, Allianz duly rejected our claim on grounds that ours was a case of flight "cancellation" (as opposed to "delay" or "suspension") which - surprise, surprise - wasn't covered under the policy. We were in disbelief. After two failed appeals, we referred the matter to the Malaysian central bank's Financial Mediation Bureau (FMB) for arbitration. This was in June 2010 (amazingly, the dispute was to drag on for three numbing years). A dozen tripartite correspondences were exchanged in that time - and last Tuesday, we received this letter from FMB which outlines their final decision with regards our grievance. I won't delve into its contents as they're pretty much self-explanatory with a clear synopsis of events. I urge you to read on, especially the full text of FMB's letter. Believe me, this is a good life lesson; it could happen to you. 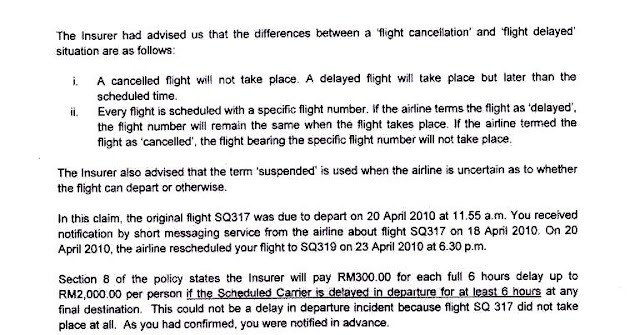 Note how a formal letter I obtained from Singapore Airlines explaining that the situation was effectively one of flight suspension was literally brushed off by the insurer. Unbelievable. So there you have it; even FMB, for all their good intentions, couldn't do much. 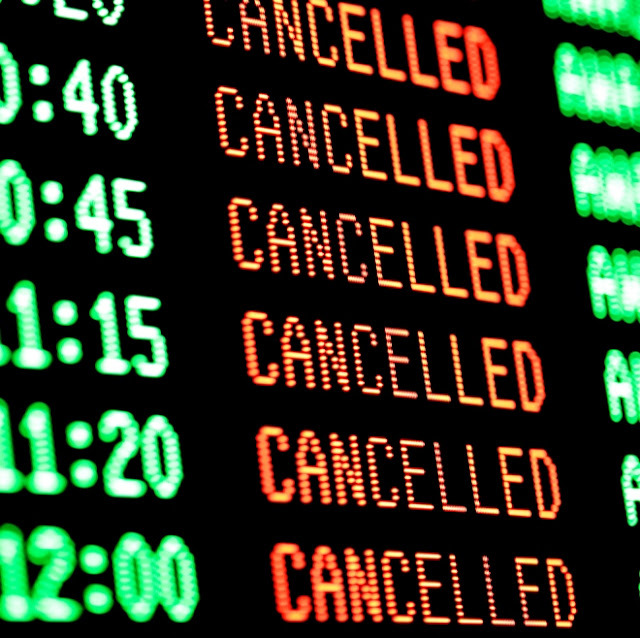 The cold, hard fact is that flight cancellation benefits are not covered under most travel insurance plans. 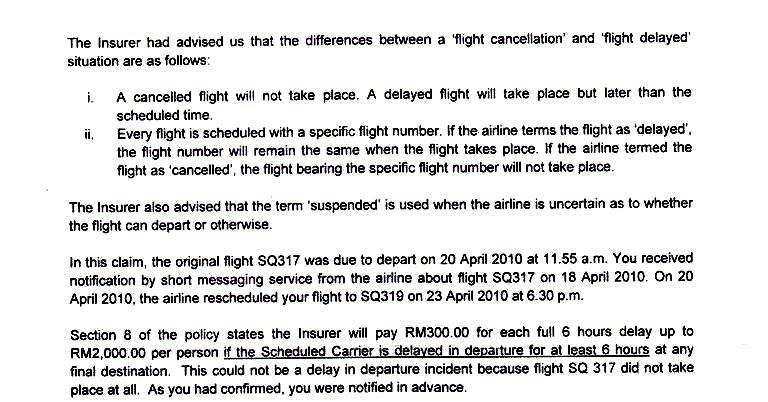 And this isn't unique to Malaysia; I've since learnt that "flight cancellation" is a standard exclusion almost everywhere. Now, I'm not writing this out of spite; we respect FMB's decision. I merely wish to share with everyone my personal experience and to highlight a widespread (but potentially dangerous) notion that all travel insurance plans necessarily offer flight cancellation benefits. The sad fact is most DO NOT, and many a times, honesty and good faith goes right out the window when it comes to insurance claims. Nonetheless, I still opine that travel insurance remains very necessary by virtue of its many other benefits, and I certainly wouldn't advise anyone against taking one before they board that plane. But after what we've been through, I have but one piece of advice, i.e. the next time you buy travel insurance, please (1) carefully analyse the proposed plan, and (2) question its reliability under various scenarios. Read the fine print. More importantly, read between the lines as most plans only state the risks and perils they cover and not those which they do not. Hopefully, no one needs to go through what my wife and I did. 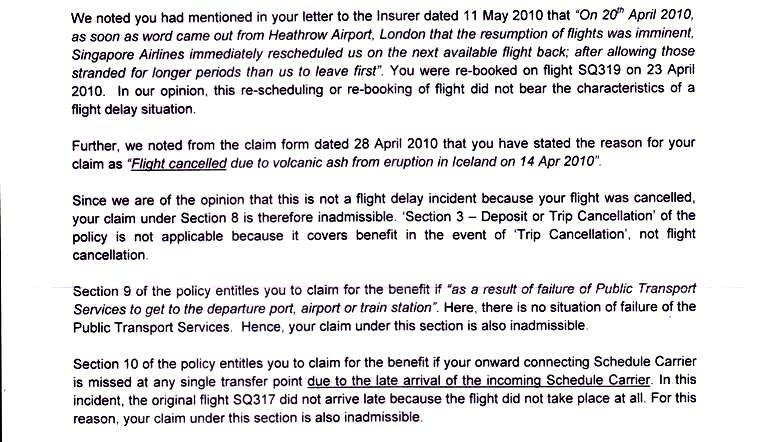 As a parting note, I'd like to share with you this archived article from The Guardian entitled Iceland volcano: Will your travel insurance cover you?. In it is a Q&A which you will no doubt find informative for your future travel planning. Have a great day, everyone... and remember, travel safe always. Did you find what I shared here useful? Have you ever had issues with your travel insurance? 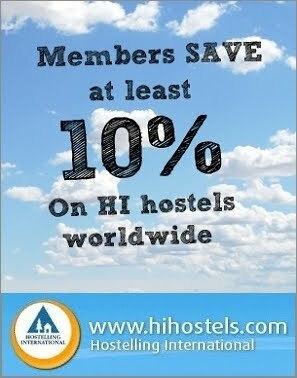 If so, please share your experience(s) in the "Post a Comment" field below for the benefit of travellers who may be reading this blog post. We'd all love to hear from you. Hi Vincent, I'm sorry to hear about your experience but I don't agree with you that a travel insurance is imperative, except for an insurance for medical emergencies. Travel insurances are overpriced and it is very hard to claim anything, I think both are due to the fact that travel insurances have to deal with a lot of false claims. Besides that, like your experience shows, when you really need it they won't help you. I'm surprised that in your case they don't even mention 'force majeure/act of god' since the ash cloud problem was something never experienced before. Also the terrorism that you mention in the beginning of your article is not covered anymore by any travel insurance since 9/11! But anyway, my advice would be to bring as little valuable things as possible on your trip, and if your camera etc. gets lost you will be able to pay it back with the money that you saved from the premium pretty quickly. 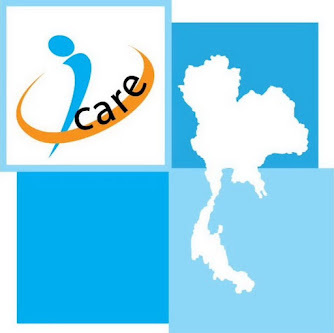 Just take care of the medical insurance, because the cost of medical expenses or repatriation can soon be higher than you would be able to pay out of your own pocket. Hi, u didn't leave your name. Well, I did mention about force majeure and Act of God to the insurer but the gist of the problem was actually flight cancellation. Allianz didn't really want to know what caused the cancellation. Like you said, it's always difficult when it comes to such claims. It was a bit of a blow financially but a good lesson learnt nonetheless. From what you said, I take it you're from America. 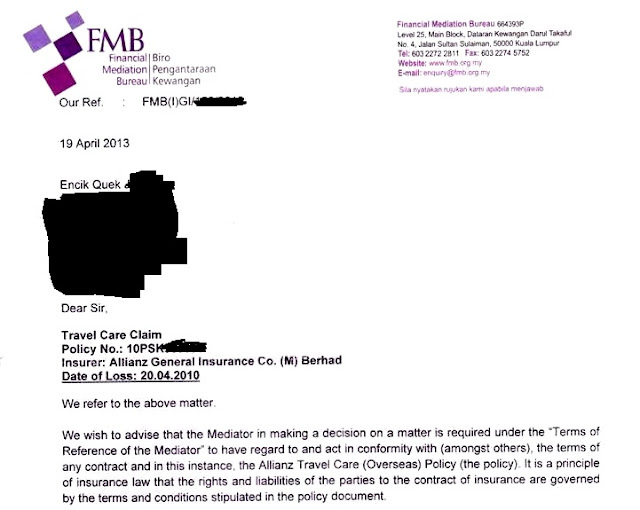 Fortunately, hijacking still forms part of the risks covered by insurers here in Malaysia, including travel to the USA. And travel insurance premium here is relatively cheap, which is good. Thank you very much for your sound travel tips; I'll definitely keep them in mind. Very nice of you indeed to drop a line - and a most meaningful one too. Hi Vincent, I'm from Europe (living in Asia) and after 9/11 all European insurances issued an update of their policies in which terrorism is not covered anymore. I wasn't aware that this is not the case for Malaysia, so maybe a travel insurance is more value for money here then, especially when the premium is low. Although I don't think it is smart from Allianz to treat you like this, this was an extraordinary case. I was stuck in KL myself during the ash cloud and many of my friends and colleagues were stuck around the world, if all people that were affected had to be compensated it would have cost a fortune and the airlines were already making huge losses on this. Too bad for yourself (and me as well btw, I didn't get anythying either), especially that it has been dragging on for so long. Hope your next travels will be better! Thank you, Lennart. 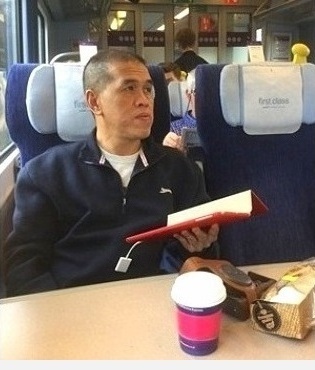 Hope you had a good time in my country - ash cloud aside, that is. Oh absolutely, DTI. Thanks for the comment. I'm happy you liked it, James. Thanks for the feedback. Thanks to show me reliability of travel insurance I will be more safe in future taking travel insurance on holidays. Hey, Paul, the pleasure's mine. I'm glad u found this post informative. Very thoughtful and kind of you to share with us such a personal experience, Vincent. I find the article very useful indeed. 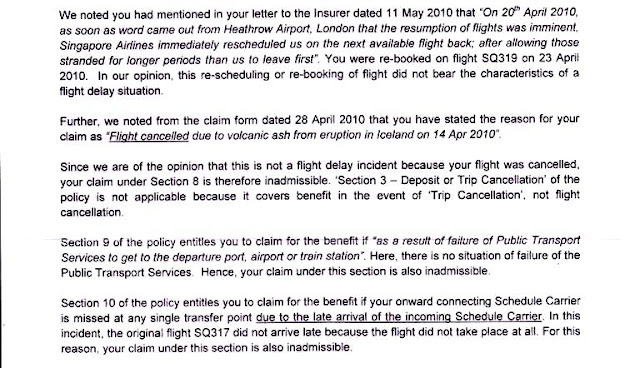 To be honest, I'd always assumed that flight cancellations are covered as a matter of course. I'll need to be more wary of this next time. Thank you once again. Hello, Mr McCarthy. I assure you; you're not alone on that score. Little excite me more as a blogger than knowing that what I've written has touched someone. Thanks very much for popping in and leaving a line. Much appreciated. For a really low monthly fee of as low as $20 you could have the advantage of the negotiated rates. It's one way to obtain low priced family health insurance plan. As you'd anticipate, these policies are far more complicated. A minimum premium should be paid, when a maximum allowed amount is usually paid. This includes reimbursement of cost of treatment and the use of hospital facilities for the treatment. You can still get 2018 health insurance 2 ways: If you qualify for a Special Enrollment Period due to a life event like losing other coverage, getting married, or having a baby. If you qualify for Medicaid or the Children's Health Insurance Program (CHIP). You can apply any time.